The Crocodile is a walking aid for disabled children and youngsters, who need supplementary assistance with their daily walking. Crocodile aims for harmony, balance and rhythm. Placed behind the child, the frame allows freedom of movement and facilitates walking in the upright position. The adjustable handles can be individually adapted to a position conveniently close to the child’s body providing maximum support and stability. The Crocodile is light, easy to dismantle and safe and easy to use. 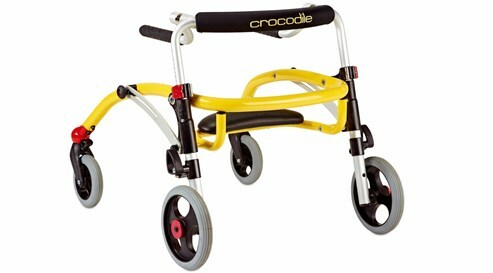 Crocodile can be used just as effectively by a child who needs little support or by a child needing a fully supported upright gait trainer with all the accessories added. The Crocodile is available in three sizes and suitable for a large group of children and youngsters. Not all children are alike – that is why it is important to use the measuring chart to find the correct size.